Paul's room is absolutely darling - you did a beautiful job. okay, the monkey on the floor is so funny I almost peed my pants! so dang smart and clever! lovely room to go to sleep in, play in and be a kid in! Absolutely love the rug! It cracks me up! Very creative! Those the rest of the room and those stickers look great too. 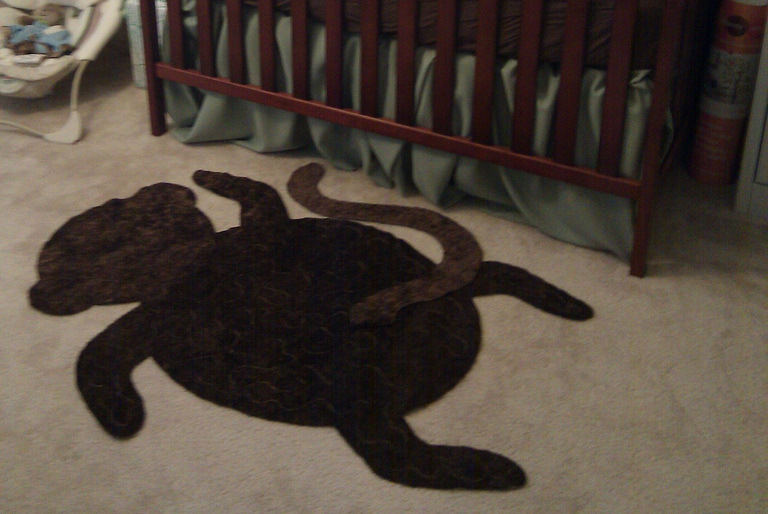 This baby room is soooo cute! The wall stickers are such a good idea for a rental. You did a really great job on the rug- what a clever idea to make the tail like that. CUTE! i'm getting ready to start on a nursery for our little girl!! If you stop by my blog, check out my giveaways. It's all baby stuff and handmade. I'm guessing you would like it! What a cute nursery, you did a fab job!! I love the tree decals and that rug is too cute :) Thanks so much for sharing, see you next week! www.tidbitsofabby.blogspot.com if you want to see. To Cute! Wow, this is too adorable, I'm all about all things Monkey, hence the name. LOL I'd love for you to link up at Texas Monkey for All About You and show this off. http://texasmonkey.blogspot.com/2010/10/all-about-you-monday-link-up_25.html We have a party every Monday so would love for you to be a regular with all of your talent!